I’d wager that if you asked the average person to name one important event during the First World War, many people wouldn’t plump for a military action. It’d be an interesting experiment to find out how many people in Britain today know the name of any major battle, beside the Somme. There’d be takers for Verdun, perhaps, Passchendaele and probably Ypres (although just like many of the men who were stationed there, hardly anyone, including me, would quite know how to pronounce Ypres– the British soldiers stationed there called it ‘Wipers’). German and British soldiers meeting in no-man's land, Christmas 1914. No, the event that has lived longest in the popular memory– that has provided fodder for songs and pop videos, and has become a myth all of its own– is the Christmas truce of 1914. 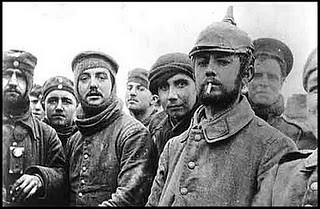 On Christmas day, 1914, despite orders to the contrary made by British commanders, an informal ceasefire took place between German and British soldiers on the Western Front. For just over a day soldiers on either side in Flanders held off attempting to kill each other: a peaceable act that has become a kind of popular shorthand for the good faith the common man has for his fellows, even in the worst of circumstances. What are the facts? You’ll find them nicely laid out at The Long, Long Trail website. Only five months into the war, neither trench lines nor mental lines were drawn as absolutely between the combatants as they would become later. Fraternisation with the enemy, especially at Christmas, was recognised as a risk to discipline: General Smith-Dorren ruled early in December that “unofficial armistices, however tempting and amusing they may be, are absolutely prohibited”. Yet as Christmas neared, local truces occurred. These meant that wounded men could be retrieved from no-man’s land, and that the dead could be buried. In addition, the close proximity of the two sides to one another meant that one side could hear the other singing carols– even see the other erect Christmas trees above the trenches. 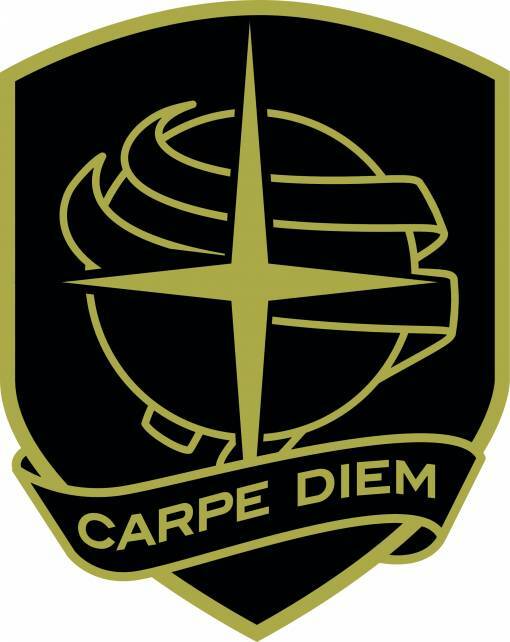 Christmas, and the feelings stirred by the season, seemed to encourage the “‘live and let live’ theory of life” that Smith-Dorren feared would destroy “the offensive spirit in all ranks”. On Christmas Eve, the miserable wet weather of the season relented a little, with a hard frost that made life easier for all on the front. Fighting continued, but meetings were held between the sides to collect and bury bodies. This fraternisation continued into Christmas day, tolerated but not approved of by the British army authorities: it is the Germans who generally initiate contact. Some men share cigarettes and cigars; elsewhere beer and plum pudding; letters are passed on; often the erstwhile combatants simply talk. You can read some of the fascinating first-hand accounts at the well-sourced Hellfire Corner. There’s something genuinely humbling about the tales the soldiers tell: and a wonderful sense of perplexity and delight amongst those taking part that such a thing could occur. 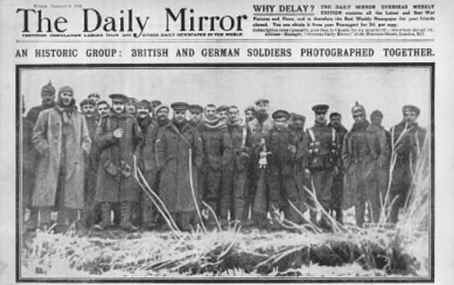 'An Historic Group: British and German soldiers photographed together': from the front page of The Daily Mirror. If you want to read in more detail about the Christmas truces, I heartily recommend Operation Plum Pudding’s excellent site, The Christmas Truce 1914. Here, volunteers have collected many of the personal stories printed in the columns and letter pages of newspapers about Christmas 1914. Those of you English A-level students who are more ‘visual learners’ (read: ‘lazy’) you can check out some good snippets from documentaries on YouTube: a tale from Ploegsteert Wood in Belgium and a first-hand account from a British soldier. There’s also a dramatisation from the great 60s anti-war satire, ‘Oh, What a Lovely War’. This takes from some of the sources above, but channels them into a humanistic critique of the conduct of the First World War. It’s well worth watching: though remember that what you’re watching isn’t real, it’s an interpretation of the known events with a modern message– that war is wrong. Bear in mind that, as much as you may agree with that point of view, the actual people involved in the truces were caught in a far more complicated net of feelings about war and peace. ‘Oh, What a Lovely War’ takes the Christmas Truce of 1914 and understands it as a triumph of human fellowship in the face of modern warfare and modern politics. Yet, if we wanted to, we could complain about this point of view, too, and call it sentimental nostalgia: after all, it was Christian values that allowed these men to talk together in no-man’s land, but Christian values were in little evidence in the build-up to war. Or we might observe that the Christmas truces were the last flowering of a more honourable age of warfare, dying more or less on Christmas day 1914. Or we could complain about the way the Christmas truces have been separated from context and become a bland, popular fairy tale: watch Paul McCartney’s video to Pipes of Peace (1983), for example. We can gripe about much of the myth when compared to the fact. Ultimately, however, the Christmas Truce as a myth and in fact speaks to us today as saying something basically optimistic about human beings. Without the rules and necessities that propel us towards evil the truces seem to suggest that human beings are basically good. That sentiment is encouraging: as is the knowledge that, in truth, many men really did stop killing one another during Christmas 1914, and treated each other like decent human beings. Something to celebrate.